The Ducks have been resting up and are ready for the Flames, but Calgary is rolling and won’t be an easy opponent for Anaheim. The Ducks’ depth scoring came to life in the first round, but the Flames can answer with their young, talented snipers. Don’t expect Anaheim to get by in four games in the second round. ANAHEIM: Never feel safe against the Ducks. In the first three games of Anaheim’s series against Winnipeg, the Jets led going into the final frame and walked away empty handed. During the regular season, Anaheim won 12 games when trailing entering the final frame and that was the best winning percentage of any team in the league. The Ducks’ offense is finding depth scorers at the right time, too, so simply shutting down Ryan Getzlaf and Corey Perry won’t be enough. CALGARY: Down 3-0 in the first period of Game 6, the Flames stormed back and defeated the Vancouver Canucks 7-4 to eliminate them from the post-season. 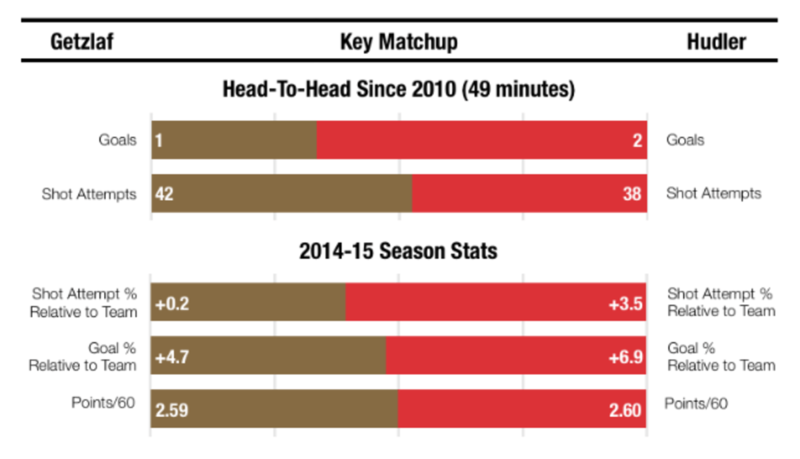 All season long, Calgary has defied what underlying numbers say about them and the same goes for the first round. Their young scorers came to life against Vancouver and Michael Ferland made a name for himself as a dominating physical presence that can get under the skin of the opposition. ANAHEIM: Ryan Kesler’s play against Winnipeg – especially at the MTS Centre – was outstanding. The Ducks brought him in to be a key component of their second line and he’s been that and more. For the third straight year, he failed to reach the 50-point plateau, but even those who wanted more out of Kesler during the regular season have been silenced after his huge first round. Kesler has been paired with Jakob Silfverberg to create a second offensive duo for the Ducks. CALGARY: The NHL’s awards only encompass the regular season for good reason, but if playoff performances were to be taken into account it would be hard to vote for anyone but Johnny Gaudreau as rookie of the year. Against Vancouver, Gaudreau notched two goals and six points in six games, but made a number of spectacular plays with the puck and was a threat every time the puck was on his stick. What’s more is that of all Flames forwards, only Sean Monahan (19:58) averaged more ice time than the rookie Gaudreau’s 19:49. ANAHEIM: 1. In Game 4 of the first round, the Ducks finally took a lead into the third period, but waiting until that late in the series to do so is a dangerous game. 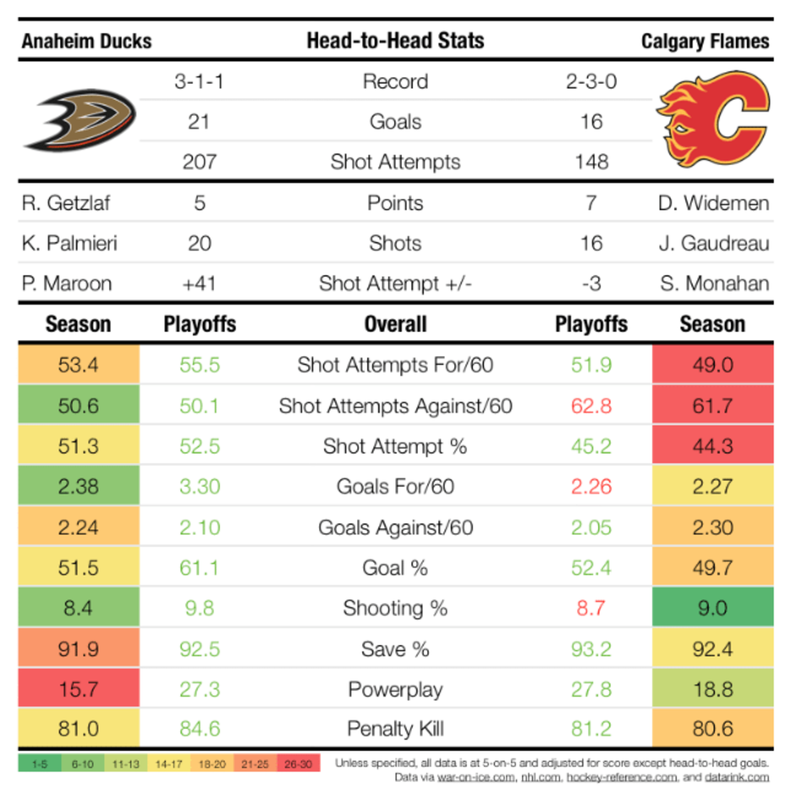 Against a team with a quick-strike offense like the Flames, Anaheim is going to want to get ahead and stay ahead because at times it can be hard to stick with the Calgary offense. 2. Goaltender Frederik Andersen has played five career games against Calgary and, though he has yet to lose in regulation, his 14 goals against, .890 save percentage and 2.87 goals-against average against the Flames leave much to be desired. Andersen was mediocre in the regular season but good against the Jets. If his play from the first round carries over, that’s great. But if his past against Calgary is indicative of what’s to come, it could be cause for concern. 3. Was Jakob Silfverberg’s play in the first round a sign of things to come? Because if it is, it wouldn’t be shocking if Anaheim skates to another four-game sweep. By giving the Ducks a ferocious second-line attack, Silfverberg and linemate Kesler take away the focus from Perry and Getzlaf and will force Flames coach Bob Hartley into a tough decision about which defense pairing faces which line. CALGARY: 1. The kids are better than all right. Monahan and Gaudreau are a combined age of 41, but they’re playing this post-season like veteran leaders. They top Calgary in ice time, combined for 11 points in six games and have the ability to light the lamp at a moment’s notice. Everyone expected both young guns to shine this season, but how ready they’ve been for every challenge that has faced them is outstanding. 2. Say what you will about the importance of physical play, but Ferland has been to the Flames what Milan Lucic is to the Boston Bruins. His take-no-prisoners style of forechecking had him straddling the line between clean play and a parade to the penalty box, but it got him under the skin of the Canucks. He even managed to find the score sheet with two goals and four points. Make no mistake, Ferland’s game can be about more than the big hit: in 2011-12 with the WHL’s Brandon Wheat Kings, he had 47 goals and 96 points. 3. Last season, Jonas Hiller lost his starting job to the Ducks’ goaltending duo of Andersen and John Gibson. Now, he has the chance to make Anaheim regret the decision to ever let him go. To say Hiller will be playing with a huge chip on his shoulder would be an understatement. Of goalies remaining in the Western Conference, Hiller’s .931 SP is second only to Scott Darling’s .936. The Flames haven’t won in Anaheim since the 2005-06 post-season so Hiller will have to be sharp if Calgary wants to steal home-ice advantage. ANAHEIM: The Ducks were looking like paper tigers again this season, but some shrewd additions at the deadline have turned them into a serious threat which showed in a dominant first round series against the Jets, one of the best possession teams in the league. Shot generation is up, shot suppression is down and they’re as efficient as ever at putting pucks in the net. Special teams are up, too, making the Ducks one of the scariest all around teams in the West. The Ducks dominated the Flames during the regular season and that’ll probably continue in this series. CALGARY: Throw all the stats out the window for this team, they don’t matter. This team just finds a way. The Flames had just 45 percent of the shot attempts against the Canucks, which is actually an improvement over their regular season numbers. That usually doesn’t win many hockey games, but their fast-break counter attack contributes to higher efficiency shots that they’ve capitalized on consistently this season. If they can keep that up and their goaltending stays hot they can potentially keep the magic alive. Just as everyone expected, Jiri Hudler outscored Ryan Getzlaf this season. It’s hard to believe, but it actually happened. They scored at an almost identical rate at 5-on-5, but the Flames scored more goals with Hudler on the ice than off compared to Getzlaf and the Ducks. Combine that with great possession numbers and it really puts into perspective what a season Hudler has had. We know Getzlaf is great, but Hudler was arguably better this year and it’ll be great to see the top guns trade goals in this series.